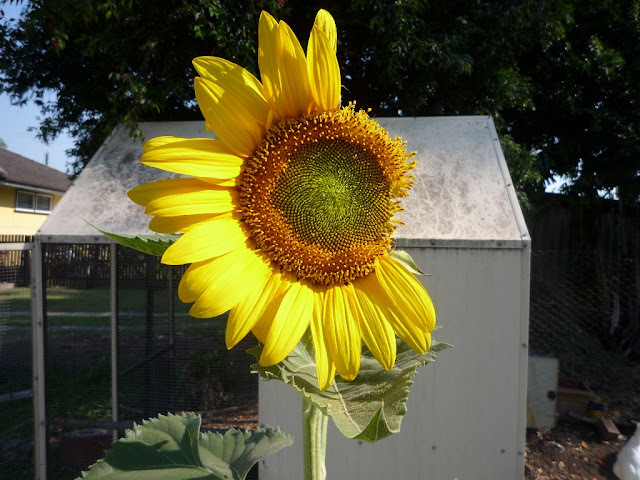 A few months ago a sunflower sprouted from some of the scattered bird seed and somehow managed to avoid the avid raking and digging of chicken feet. With a little sprinkle from the hose every now and then it gradually grew taller and taller, even outgrowing me (not that that's hard though). Eventually it started to bud and the anticipation climbed until the day someone decided they'd have a munch. I didn't manage to catch the culprit red-handed (or yellow-beaked and sulphur crested for that matter) but given their track record I'm going to blame the cockatoos. Luckily it didn't damage the flower too much and it's still managed to put on a good show. As soon as the seeds start to form they'll be back and all I'll have left to admire is this photo and the beautiful sunshine stealing birds. Maybe one of them is in love and thinking to herself "he loves me, he loves me not" as she munches her way around the flower. How sweet. Brilliant of you to capture the 'sunshine being eaten'. Thanks David. They've been back again over Christmas - still working their way around the flower head.